Another one of my favorite Viget traditions is our annual holiday gift. While we love getting cards from others, we've always felt that sending out a simple card is just too ordinary for us. And while creating e-cards is fun, we like to break out of our comfort zone as a team and do something creative that's not "web." So ... every year, everyone pitches in to help make about 300 gifts, and we send them to all the folks who helped make the year so fun and successful. We've made VigorBalm, Vigoroma, Vigelicous, and, last year, VigeTags. This year, it's VigetRocks. 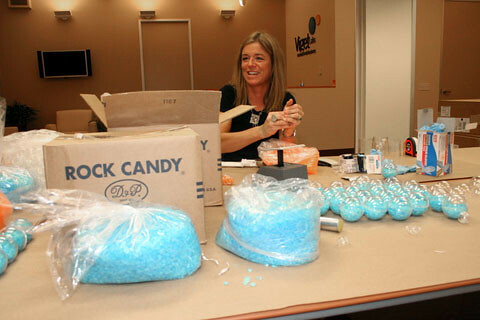 Blue and orange rock candy carefully delivered in difficult-to-open plastic containers. If you hold yours on it's side and spin the balls around, you'll notice the Viget logo in there somewhere. We had fun putting them all together (some more than others). Since we couldn't track down every address we wanted to, we have a few extras. If you didn't get some Rocks but want a batch, comment below and we'll send 'em out right away (while supplies last.) Happy holidays!